ICANN should resist attempts to turn the organization into a content regulator responsible for fighting piracy, counterfeiting and terrorism. That’s according to CEO Fadi Chehade, speaking in Dublin yesterday at the opening ceremony of ICANN’s 54th public meeting. His remarks have already solicited grumbles from members of the intellectual property community, which are eager for ICANN to take a more assertive role against registries and registrars. Speaking to a packed auditorium, Chehade devoted a surprisingly large chunk of his opening address to the matter of content policing, which he said was firmly outside of ICANN’s remit. He presented this diagram, breaking up the internet into three layers. ICANN plays in the central “logical” section but has no place in the top “societal” segment, he said. That basically means that ICANN has no responsibility to determine which web sites are good and which are bad. That’s best left to others such as the courts and governments. Chehade recounted an anecdote about a meeting with a national president who demanded that ICANN shut down a list of terrorism-supporting web sites. With that all said, Chehade added that ICANN should not shirk its duties as part of the ecosystem, whether through voluntary measures at registries and registrars or via contractual enforcement. He gave the example of credit card companies that voluntarily stop doing business with web sites that have been reported to be involved in crime or spam. 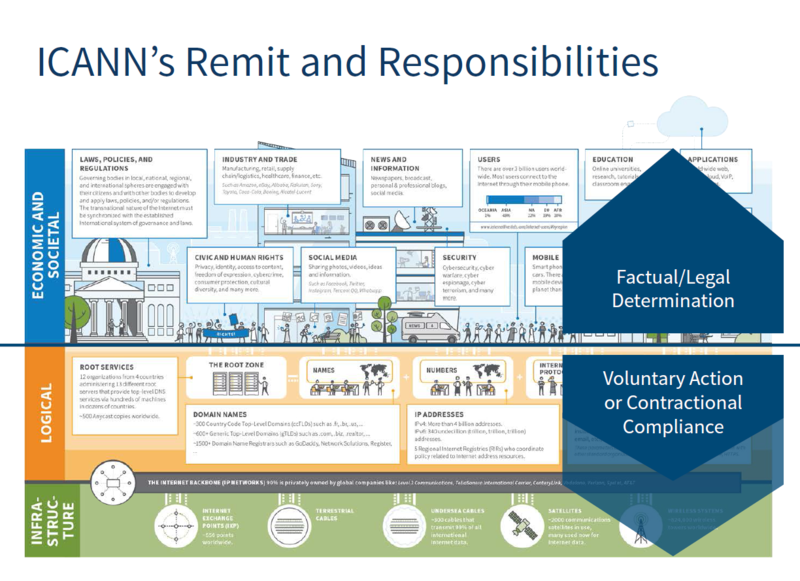 The notion of registrars adhering to a set of voluntary principles was first floated by ICANN’s chief compliance officer, Allen Grogan, in a blog post earlier this month. It was the one bone he threw to IP interests in a determination that otherwise came down firmly on the side of registrars. Grogan had laid out a minimum set of actions registrars must carry out when they receive abuse reports, none of which contained a requirement to suspend or delete domain names. The Intellectual Property Constituency appeared to greet Chehade’s speech with cautious optimism, but members are still pushing for ICANN to take a stricter approach to contract compliance. In a session between the IPC and the ICANN board in Dublin this morning, ICANN was asked to make these hypothetical voluntary measures enforceable. Marc Trachtenberg disagreed with Chehade’s credit card company example. “In order for any sort of voluntary standards to be successful or useful, there have to be incentives for the parties to actually comply with those voluntary standards,” he said. “One possibility among many is a situation where those registries and registrars that don’t comply with the voluntary standards are potentially subject to an ICANN compliance action,” he said. It’s pretty clear that this issue is an ongoing one. Chehade warned in his address yesterday that calls for ICANN to increase its policing powers will only increase when and if its IANA contract is finally divorced from US government oversight. Grogan will host a roundtable tomorrow at 10am Dublin time to discuss possible voluntary mechanisms that could be created to govern abuse.